America’s rage for unchallenged global dominance represents the greatest threat to world peace, security and humanity’s survival. It’s geopolitically out-of-control, both warrior wings of its duopoly governance hellbent on forcing its will on all other nations. Naked aggression is its favored strategy, punitive sanctions used to soften up targeted nations, imposed unilaterally or by the Security Council, its members bullied and pressured to go along instead of doing the right thing, slapping Washington down by refusing. The more often this happens, the harder it gets to resist. 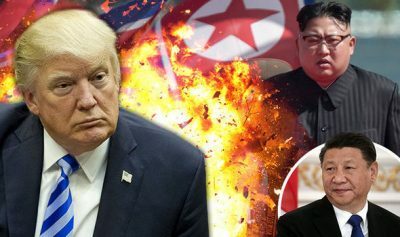 North Korea is being punished for developing powerful weapons intended solely for defense, not offense, its legitimate right, its choice which ones to pursue. A state of war has persisted with America since the uneasy 1950s armistice. The DPRK genuinely fears possible US aggression. Its only protection is having a formidable deterrent. Without it, there’s no way to defend against an attack on its territory. Multiple rounds of Security Council sanctions failed to halt its nuclear and ballistic missile programs. Nor will future ones imposed. Diplomacy is the only option, rejected by the Trump administration, preferring to maintain hostile relations, compounded by menacing threats. On Tuesday, Trump called new sanctions on Pyongyang no “big deal…nice (with no) impact.” So why impose what’s ineffective and counterproductive – an obvious point the administration fails to address. Russia and China shamed themselves for going along with what they oppose, appeasing Washington, not doing the right thing, no strategic or other benefit gained by punishing a nation wanting only the ability to defend itself against hostile attack. Moscow and Beijing have powerful WMD arsenals for self-defense. So do other nations. Is North Korea not entitled to the same right? Washington maintains a military option against the country. The threat it faces is ominously real whether or not war is launched on its territory. How will China respond to Treasury Secretary Mnuchin’s threat to cut off Beijing’s access to America’s financial system if it circumvents sanctions on North Korea? Instituting these measures would harm America as much as China. At most, individual banks and other commercial enterprises doing business with Pyongyang could be sanctioned. Chances for measures harming hugely important Sino/US bilateral economic relations overall are nil. Still, Mnuchin’s threat was unacceptably hostile, certainly not going down well in Beijing. North Korea won’t bend to Washington’s will. Development of its nuclear and ballistic missile capabilities continues, more tests likely coming. US aggression on the country, if launched, would be devastating – catastrophic if nuclear weapons are used. Featured image is from Newspot Nigeria.